You have a great bunch of prospects to reach out to. But there’s one problem. You don’t have their email ids. You could try guessing, or searching on Google, but both these options are extremely time consuming. Besides, most emails sourced in this way will bounce anyway. Thankfully, there are far easier ways of finding emails! Here are 3 simple ways to find anyone’s email address. Thinking of contacting the CEO, Head of Marketing or other key decision makers of a company? 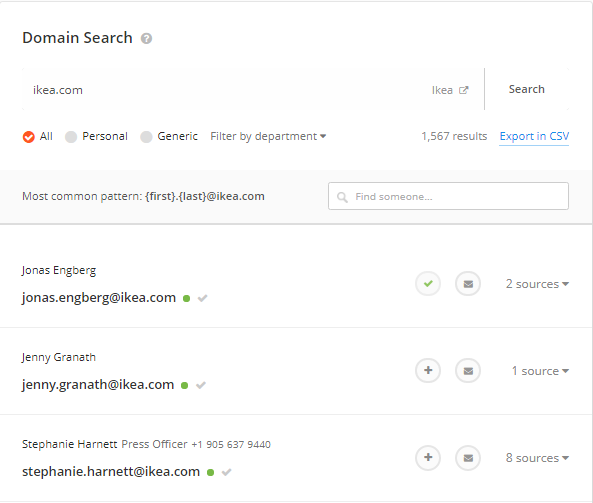 Clearbit connect is an Outlook and Gmail chrome extension which finds email addresses’ of key people within an organization. Simply enter the company name and the tool will display a list of key people along with their roles, email ids, location and social media accounts. A drawback of Clearbit Connect is that you may find it difficult to search for the email address of a specific employee in a company. Clearbit’s community plan is free to use for 100 searches per month. In return for its services, Clearbit accesses your email account for contact information so it can add to their database. Rocket Reach allows you to find email addresses, phone numbers and social media accounts from their database of 250 million professionals. After completing the sign up process, enter your target’s name or Linkedin account. The advanced search option allows you to narrow your search down to your prospect’s location, industry, job title and company. The tool displays their email addresses with respective confidence levels (of how accurate the email probably is). You can then store these contacts for later use. Rocket Reach has an unlimited free trial that allows only 3 searches per month. It’s premium plans range from $49/month (for 170 email lookups) to $299/month (1150 email lookups). So if you are looking at sourcing a few hundred emails a month, Rocket Reach is expensive! Do you want an easier and a less expensive way to find emails? Interseller simplifies the email search process with several features. Have a look at our ‘Lookup Email’ feature. You just need to type in your contact name and their website url. Enter their details in the tool and you will receive all the verified email addresses. 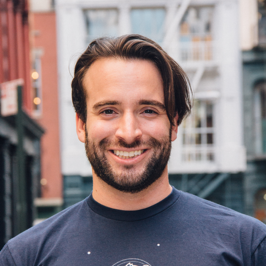 The verified emails have already been validated, and you don’t have to worry about emails bouncing and damaging your email sender reputation. Interseller is also a prospecting and an automated email outreach tool. In addition, Interseller also verifies e-mails in real-time. Therefore it saves you the trouble of using multiple tools for prospecting, sourcing and sending emails. Learn more about Interseller by getting in touch with sales. You can gather your prospects’ email address if you know their AngelList, LinkedIn, CrunchBase or GitHub profile. 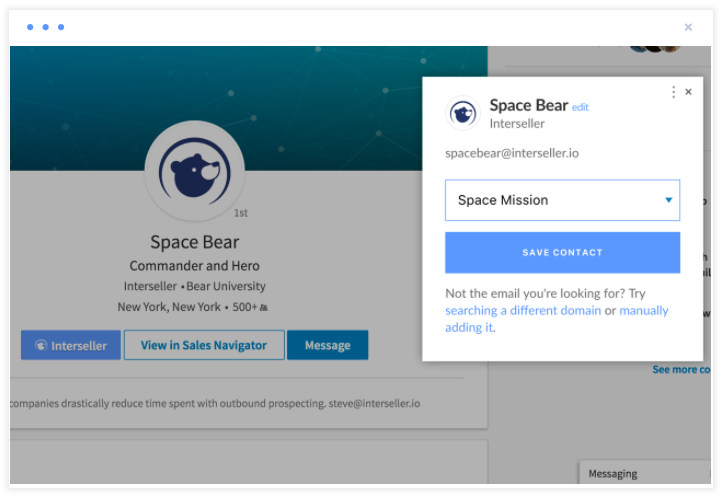 Download Interseller’s chrome extension and head over to your contact’s professional profile. One the extension is installed, you will see an Interseller button on their profile. Click on it to view their verified email addresses. You can also directly add them to your email campaign through the extension. If you make a connection with your prospect on LinkedIn, you will receive access to their personal email address, or rather, the email that they used to register on the social media site. LinkedIn allows you to export a CSV file containing the full name, email address, current employer, and role details all of your contacts. 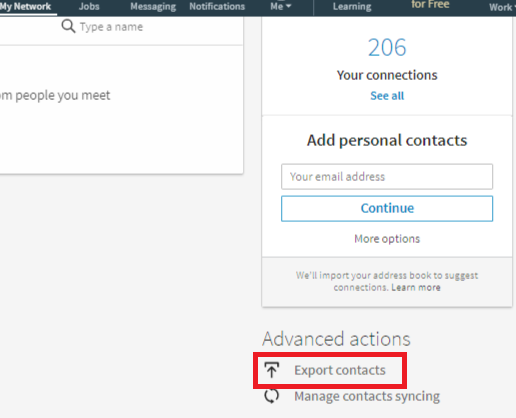 You can learn how to export your contacts here. After receiving a .csv file, use Interseller’s Bulk Lookup feature to gain access to your connection’s work email ids too. The feature converts the .csv file data into usable contacts. It searches your connection’s name and website to lookup their work email addresses. You can source email addresses of prospects through Github too. 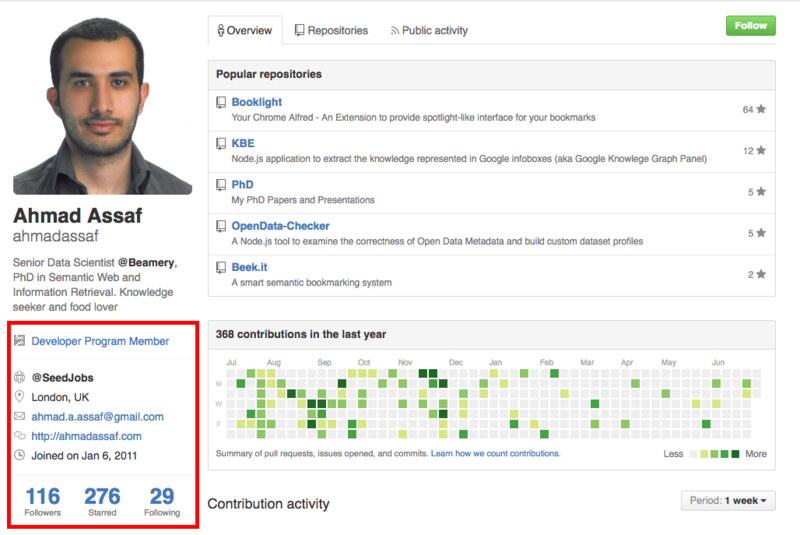 A Github profile usually includes an email address, twitter and a website link. Unfortunately, some of the best user profiles have no contact information. Copy their github profile name into namechk to find your prospect’s usernames on other social media websites such as LinkedIn, and add them as a connection. Then, you can extract their personal email id with the technique I just mentioned earlier. You can also extract their hidden email address using this Github hack. Do you wish to contact your twitter followers, or those who are following a competitor’s handle? Handle is a new tool that gives you access to email ids for followers of a particular twitter handle. The tool is still in private beta, but you can request an invite to get early access. 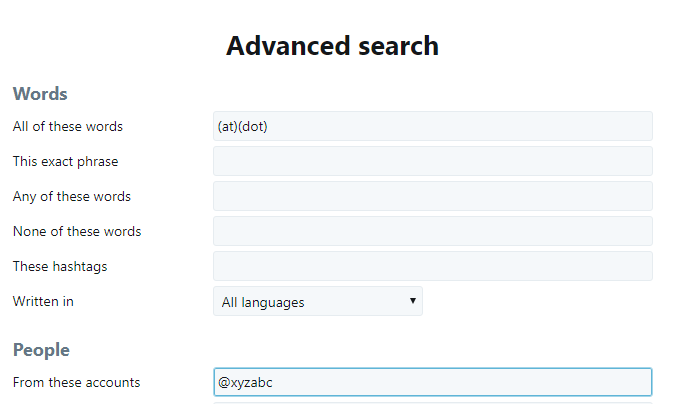 You can still try to find an email id through a manual search on Twitter. Many people receive requests to share their email address. If they have shared it, you will be able to find it through Twitter’s advanced search feature. Type in the terms (at)(dot) in the “All these words” column. You can then enter their twitter handle in “From these accounts” column. There are several tools which will guess what an email can be, based on similar email patterns for the same organization. Instead of manually trying to guess your prospect’s email id, emailgenerator.io automatically generates 50+ email address combinations. How do you check whether the potential email address is valid? Use an email verifier service such as Rapportive, to check whether your email would work. Type in the email address in the composer and Rapportive lets you know about the accuracy of the address. However, Interseller also has an email validator tool, which is is far more accurate at validating emails than rapportive. You can also use an email guessing tool such as Hunter.io. Just search for your prospect’s domain name and you would receive a list of contacts registered under that domain. 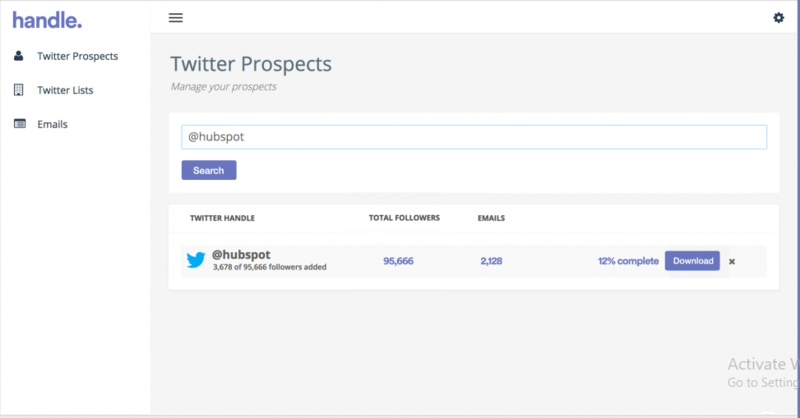 Type your prospect name in the ‘find someone’ searchbar. Based on the common email id pattern, you can receive their potential email address along with the confidence level. 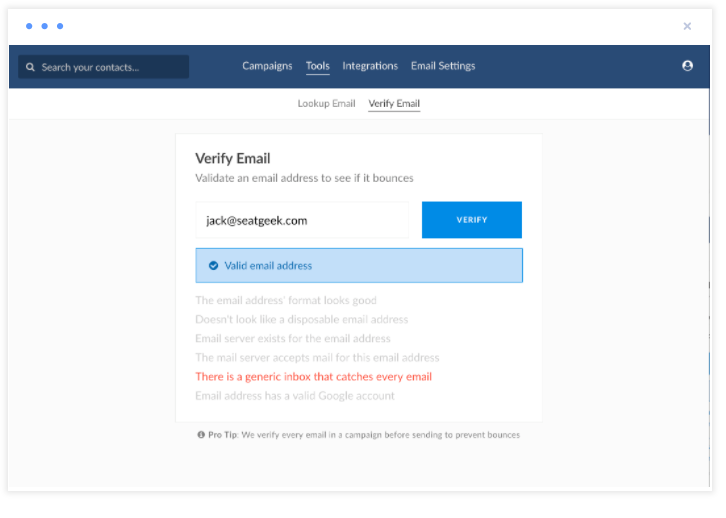 After using a set of possible emails, you can use Interseller to validate them. It’s really important to validate your emails, because bounces will damage your sender reputation and send more of your legitimate emails to recipients’ junk folders. There are dozens of tools that can help you source email addresses, but if your team needs to source dozens or even hundreds of emails a month, you need a tool that’s highly accurate, and won’t break the bank. Interseller is both, but wait there’s more, it’s also an automated email outreach tool. So why not take a minute and get in touch with Interseller.